Don’t worry there’s a boat load of cheese to make up for it. So, this is just veggies and cheese, but somehow it’s miraculous and delicious. Jay has been eating low carb lately, and while I’m definitely against crazy diets and “methods” of weight loss that invariably fail or are just too weird to maintain, I definitely am FOR eliminating things that don’t add a ton to our bodies nutritionally speaking. I love bread and pasta and fried foods and eat them more than enough, but having meals here and there that don’t include some of those things isn’t a bad thing at all, and I’ve been enjoying the challenge of coming up with dinners that aren’t boring but that also don’t include a carb side dish. Veggies have carbs, fine, but that’s not what we’re talking about. On to the lasagna! This is super simple, especially if you have a mandoline. You shave a bunch of veggies and will use them as “noodles,” then you layer the veggies with cheese and marinara. You can 100% use your favorite jarred sauce or you can make a batch of my favorite simple marinara and use it in this. I don’t mess with meat or ricotta or anything but veggies, sauce, and cheese. We bake, we let the lasagna rest, we eat. Maybe with a hunk of bread for balance? I’m the worst at low carb. 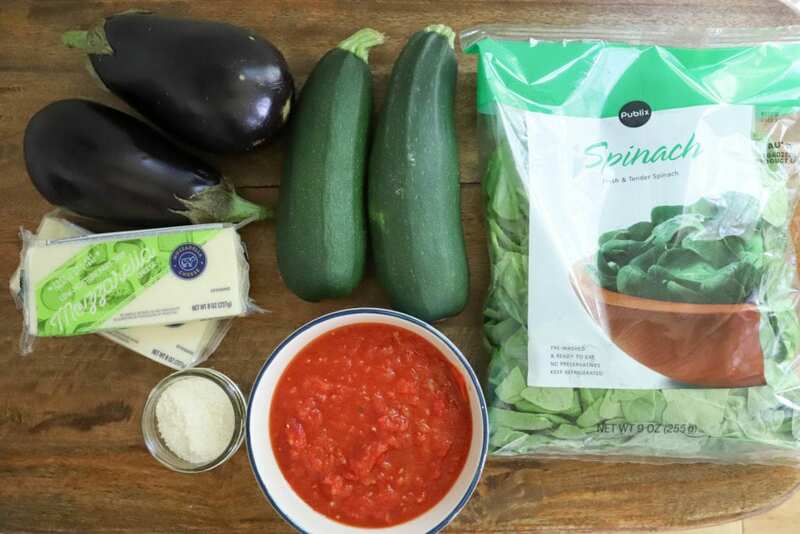 You need marinara sauce, eggplant, zucchini, spinach, mozzarella, and parmesan. That’s IT, and I love using my super plain marinara, just flavored with onion and garlic, because it lets the veggies and cheese really stand out. 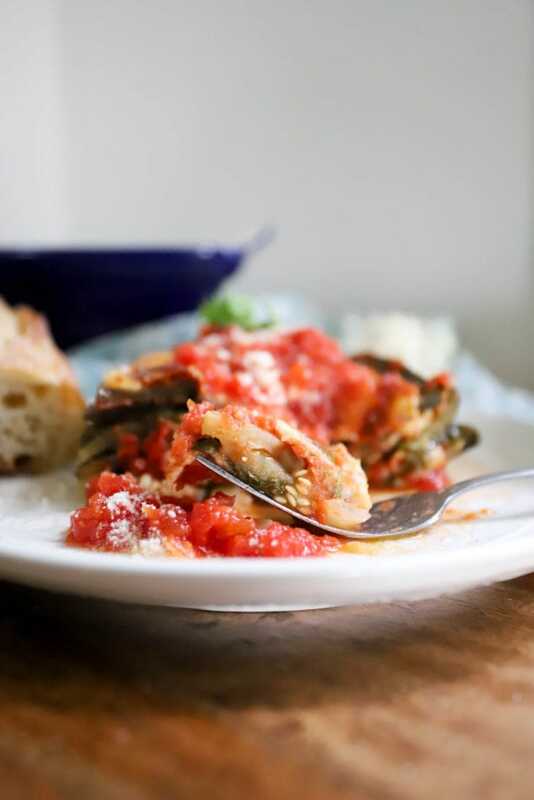 Once the marinara is made (and that lasts in the fridge for days), the rest of the dish comes together super quick. 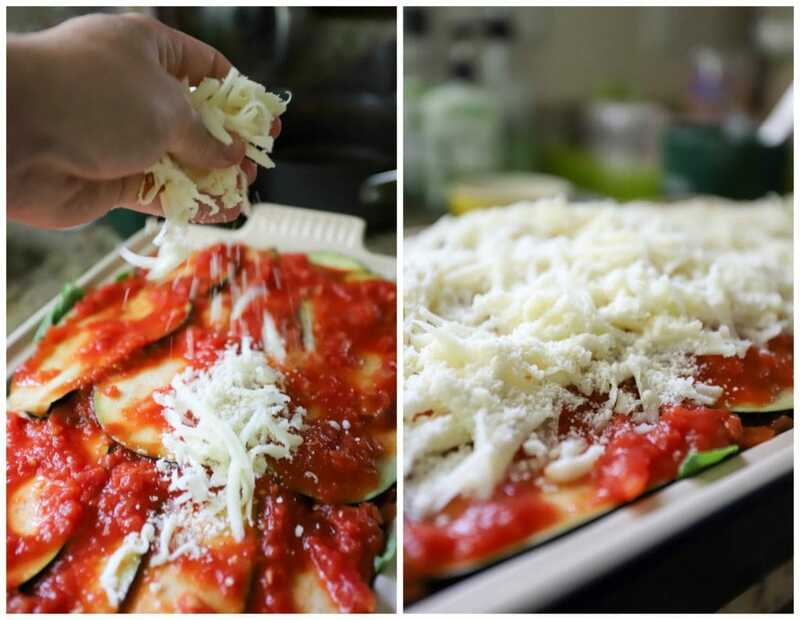 You’ll grate the cheese and mix it with the parmesan, then thinly slice the veggies on a mandoline or carefully with a knife. 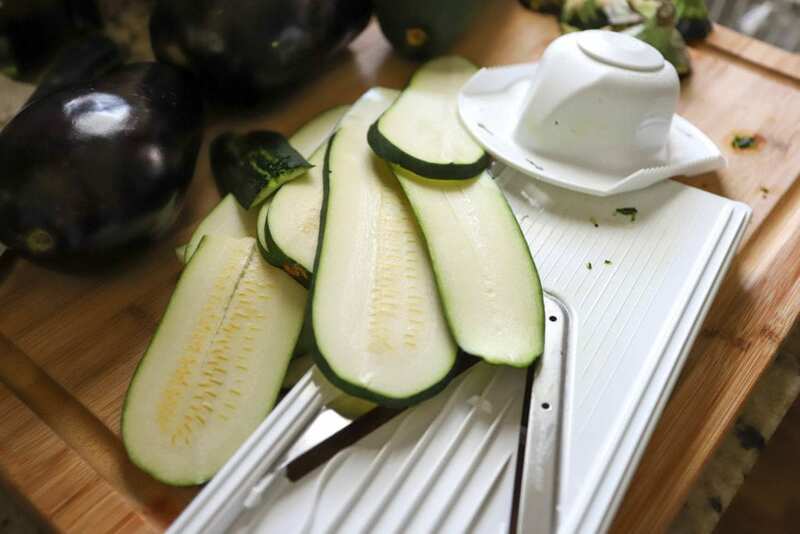 I get 8-10 slices out of a large zucchini, and use the thin slicer on my mandoline. 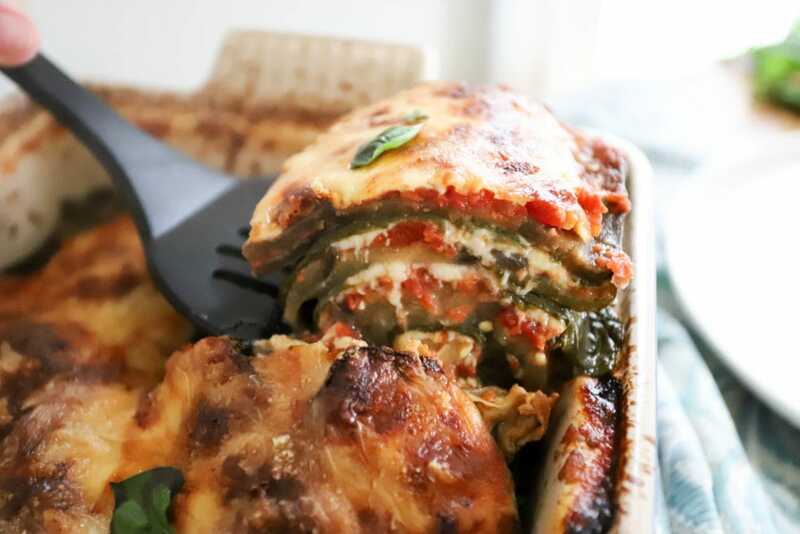 When the veggies and cheese are prepped, we layer the lasagna. 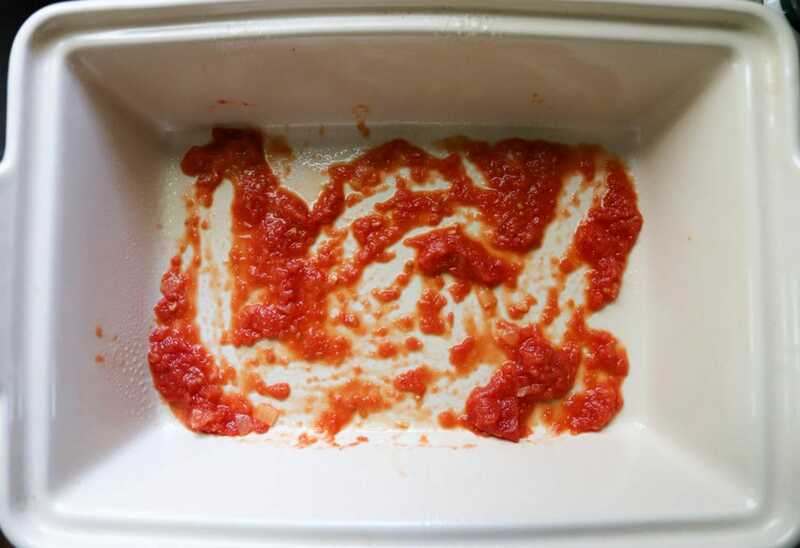 Start with some cooking spray in a baking dish, then a thin layer of marinara sauce. 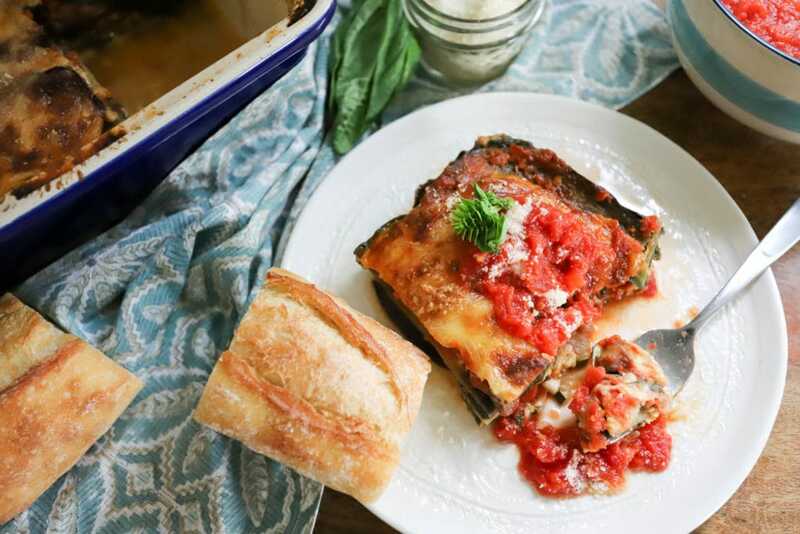 After the marinara goes a layer of eggplant OR zucchini, they’ll alternate as you build up the lasagna. Overlap the vegetable pieces so they cook together in the oven, they’ll shrink a lot as they cook. Sprinkle the veggie layer lightly with salt, then add a little bit more sauce, some cheese, and a few handfuls of spinach. 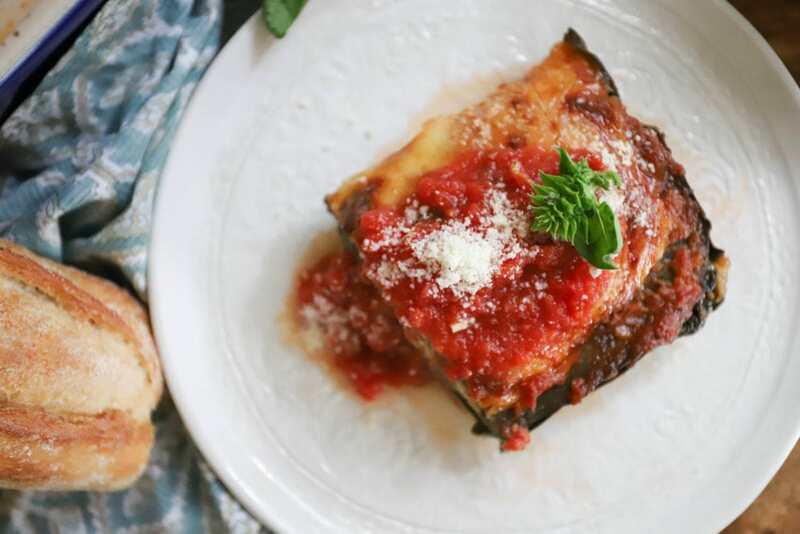 Now, repeat the process with eggplant (so eggplant, salt, sauce, cheese, spinach), then zucchini, pressing the lasagna down as you go to form 6 or so thin layers. Use as much of the ingredients as you can until the baking dish is full and just barely overflowing – the veggies will cook down by an inch or more in the oven, so don’t worry about overcrowding the pan. The last layer of veggies will be topped with marinara then the last of the cheese. Now, the cook time here is long because we want the veggies to cook way down and evaporate some of their liquid. For simplicity’s sake I didn’t roast the veggies in advance, so we want to avoid a soupy lasagna as much as possible since we don’t have noodles to absorb the liquid. 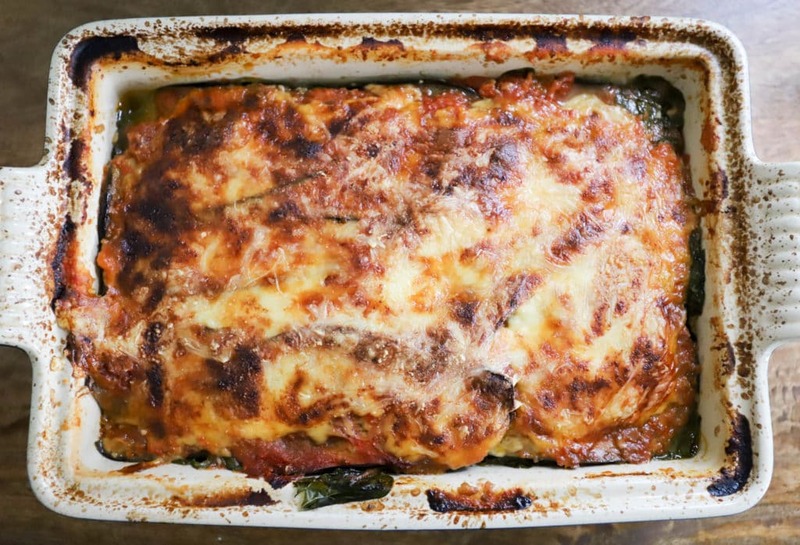 Cook the lasagna uncovered at 375F for an hour and 15 minutes, then check it – a fork should go in really easily when the veggies are done (this will depend on how thickly you cut your veggies), and there should be a little bit of liquid in the bottom of the pan but not a ton. If the cheese starts to brown before the veggies are all the way cooked, place some foil lightly over the dish without enclosing the edges so the liquid from the veggies can keep evaporating but the cheese won’t get too dark. I cooked my lasagna for an hour and 40 minutes total and covered it for the last 15 minutes or so. When the lasagna is done, let it rest! For a long time, at least 15 minutes, preferably closer to 30 so some of the liquid can reabsorb into the veggies. You may find that no matter what you do the lasagna is soupy (if you have large veggies for example that have a high water content). If that’s the case, serve one piece of lasagna then spoon or pour out any liquid in the bottom of the dish. No big deal, and the price we pay for not using any carbs. I always serve any kind of lasagna with extra sauce and bread for dunking because duh. 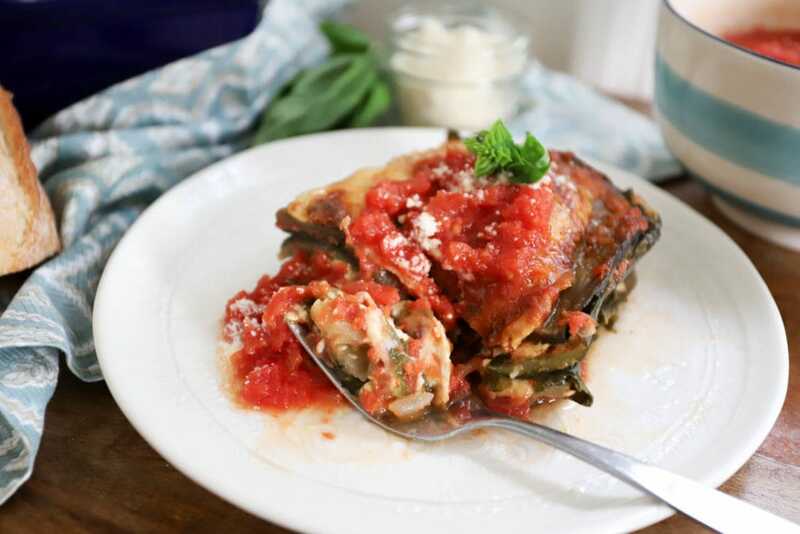 Fresh basil on top is gorgeous and delicious, and look at this lovely veggie meal! Because the veggies and marinara are so flavorful, this is one dish where I can say I don’t miss the noodles AT ALL. The texture of the vegetables mimics noodles so well because we cut the planks thinly and don’t cook the veggies in advance, so they don’t get mushy. 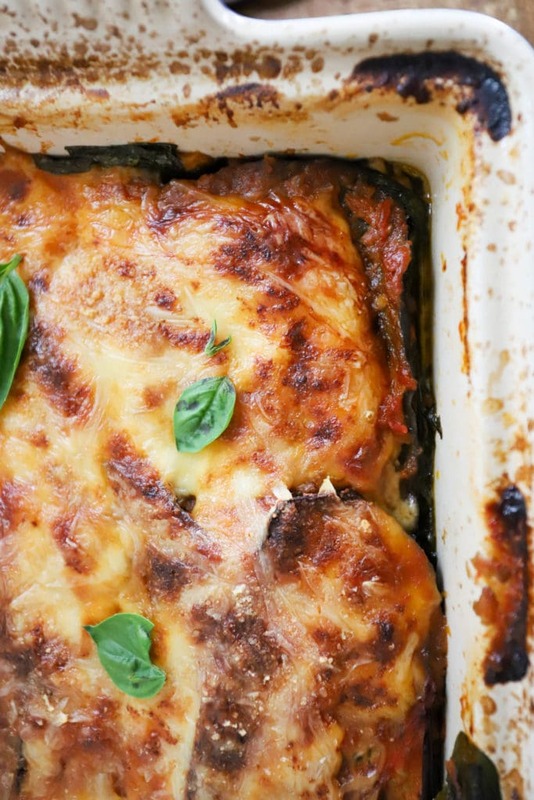 Instead, the cheese holds everything together and the flavor of the eggplant and zucchini shine through. Here’s to a few fall recipes that aren’t totally full of rice and potatoes, right? But just a few. Preheat the oven to 375F and spray a baking sheet with cooking spray. Build the lasagna. 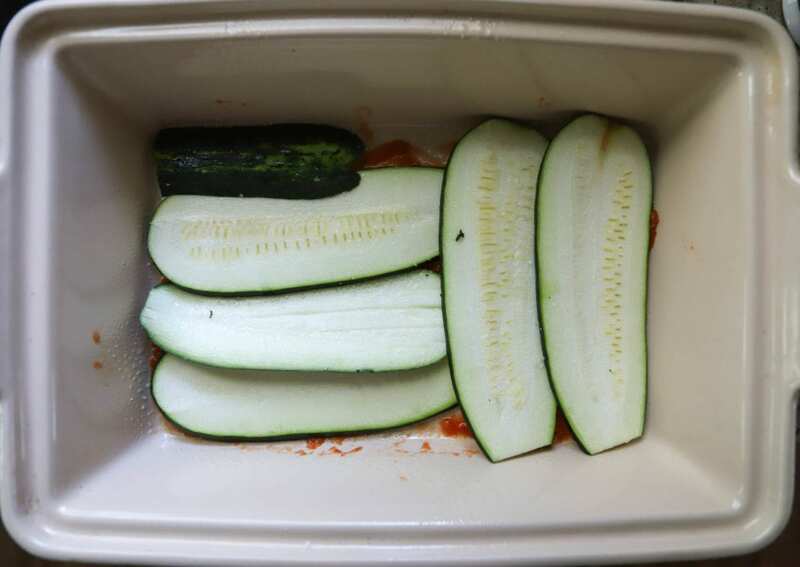 Spread a thin layer of marinara in the bottom of the baking dish, then make a layer of zucchini, overlapping the pieces to completely cover the bottom of the baking dish. Sprinkle the zucchini lightly with salt. 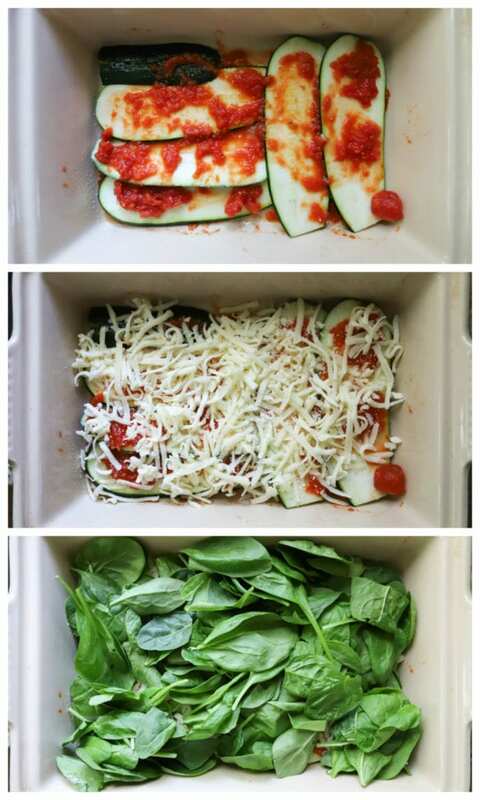 Spread a bit more marinara over the zucchini, then spread on a handful of cheese and a layer of spinach leaves. 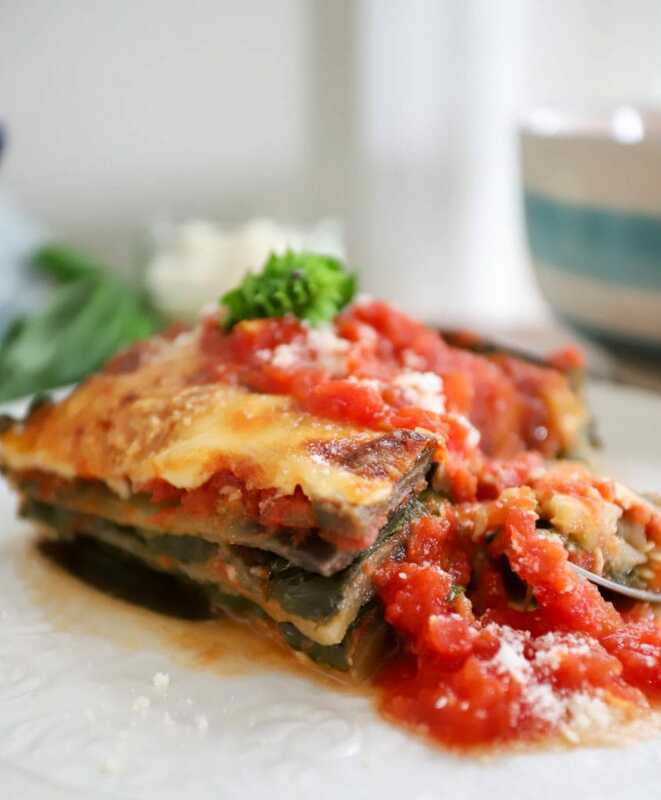 Repeat the layers, starting this time with eggplant: eggplant, salt, sauce, cheese, spinach. 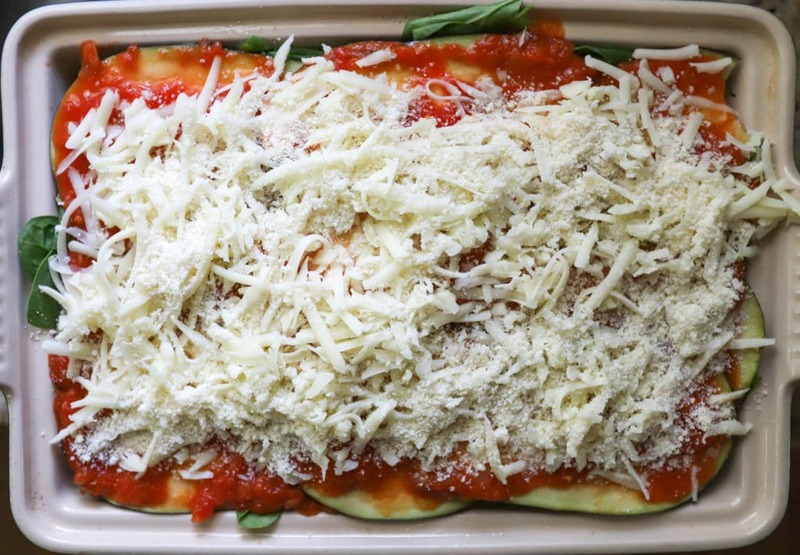 Repeat, alternating the veggies (or making some layers with eggplant and zucchini to use everything up), until you have as many layers as you can fit in the baking dish. Top the lasagna with a final layer of marinara then any remaining cheese. Bake the lasagna for one hour and 15 minutes uncovered, then remove it from the oven to test it. A fork should go easily through the layers of the vegetables and the cheese should be starting to brown. Bake the lasagna for up to 30 minutes more to cook the veggies through and allow as much liquid as possible to evaporate. If the cheese becomes very brown before the lasagna is done, place a piece of foil very lightly over the dish to allow steam to still escape on all sides. When the lasagna is done, let it rest uncovered for 15-30 minutes, then cut into pieces and serve. If there is a lot of liquid in the bottom of the dish, tilt the dish and discard the veggie juices with a spoon. Serve the lasagna with extra marinara and fresh herbs for sprinkling. Don't worry if the lasagna seems soupy, just discard some of the juices in the bottom of the dish before serving. The only problem with the timing is that the cheese will get burned after about 20 mins at that temperature. So either reduce it or have it covered for longer or from the start. Rodrigo, thanks for the comment! These instructions work as-is in my kitchen. However, you’re right, different ovens and dishes cook differently. I always encourage tweaking as needed for your particular situation!